Four grandkids on a boat! 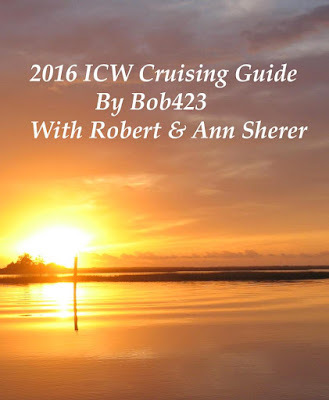 The 2016 edition of the ICW Cruising Guide is available now by clicking on the icon at left. There's information on the update on all the new features added and a button if you wish to purchase a copy. It is also available on Amazon.com and will be in ebook format later. The link at left leads you directly to the publisher which is the same one used by Amazon to fulfill their book orders. - Where not obvious, a yellow line has been added on the chart to show the best path through a hazard. 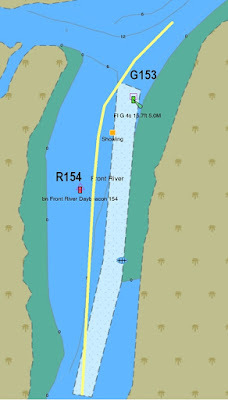 - Waypoints have been added for some of the most difficult passages such as south of Fernandina, Jekyll, Hell Gate and others. A link has been included for downloading the routes in GPX format. I've detailed how to download the GPX files into Navimatics Charts and Tides as well as into the Garmin Mobile app on the iPad. Of course, the GPX files can always be downloaded for use in chartplotters per the manufacturers' instructions. - Detailed instructions are included for transiting the Cape May Canal with its 55ft high tide bridges which are not really 55ft high. If your mast height is less than 58ft, then you may be able to take the canal passage by following the "bridge height equation" in the book at less than high tide. 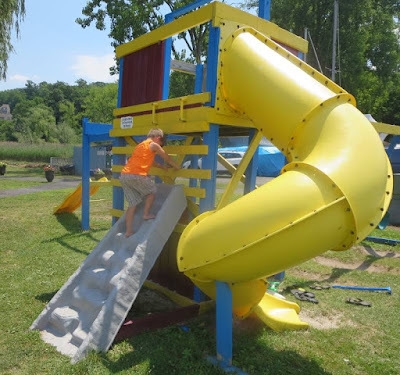 - The photos have been embedded into the flow of the hazard descriptions to get a better feel of an area. - Links have been left in blue with an underline and I will publish the links as a Page in the blog site for ease of finding the recommended apps, marinas, and other information from the guide. As you will see in the description of the guide, it is not a complete compendium of all marinas and anchorages; there are plenty of other guides for that. However, it does include the marinas and anchorages we've found spaced conveniently for ICW travel and where there's pet relief easily available. 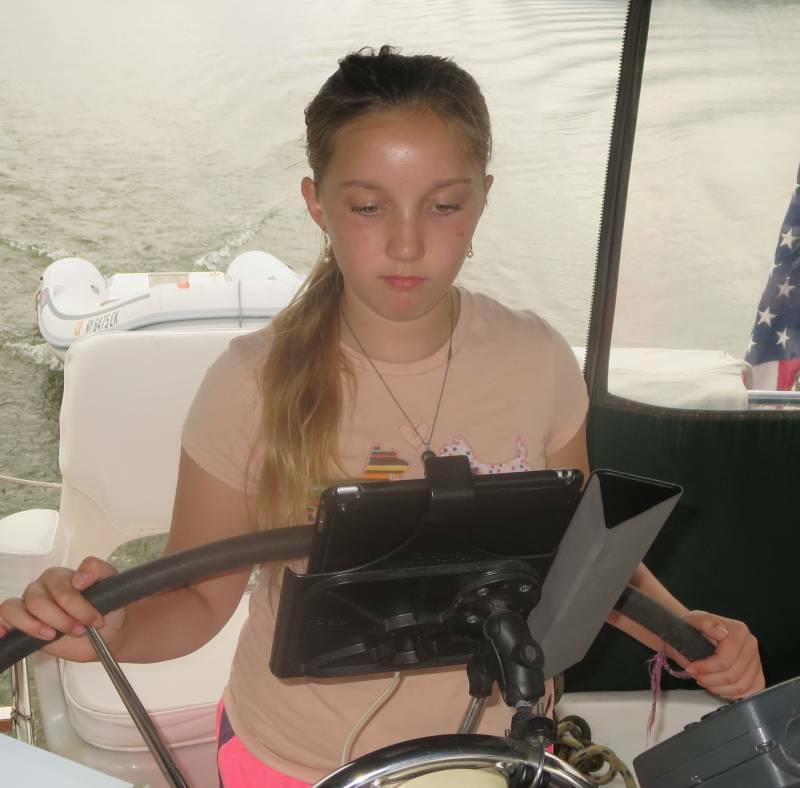 Also included are updated lists of how to get ready for the trip and tips on making life more enjoyable on the waterway. As in 2015, nothing in the book is second hand. I've been through all of the hazards at least 12 times and most recently in the spring of 2016 on my trip north from Key West. I hope you enjoy the guide and I would ask you to leave a review on Amazon.com to help other boaters. Hi, this is Sarah and today was super hot, and we went on a super long dingy ride that was so much fun. I got to steer the dingy a ways and I've gotten better at it. We also went to the pool today and spent a couple hours there. The marina is really fun because there is also a tiny playground. Hello it's me Natalie, today was very awesome! First we got to take a two hour ride in the dink and I got to drive a couple times. Then we went to the playground and played tether ball with Finn and Sarah. I am sad we have to leave tomorrow, but have had so much fun on the boat! Hi it's Finn and we had lots of FUN today we rode on the dink we went to the pool again! Hey guys this is Rowan again and I just have to say this was an awesome day! Also if my mom is reading this I love you and wish you were here, and on my party train! Well today certainly was a hot day with a high in the 90's. 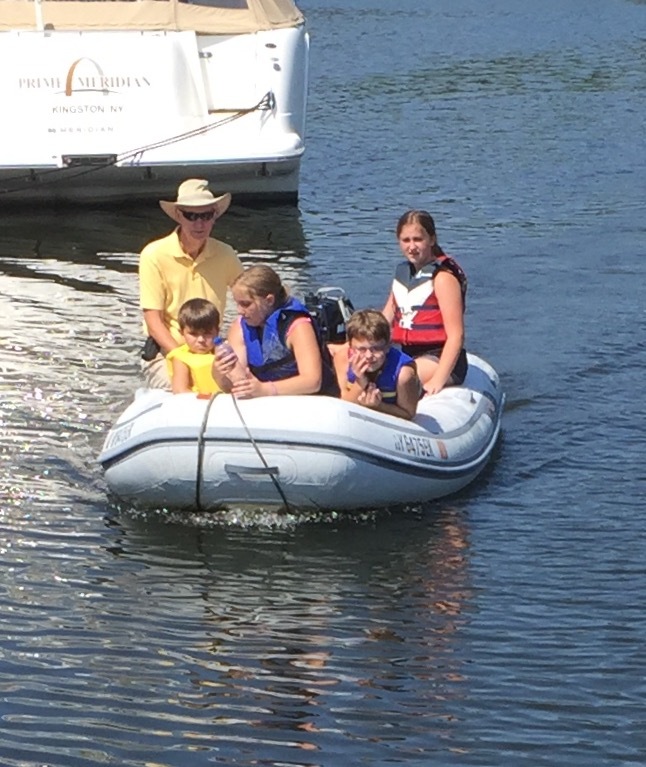 Before the heat set in we all took a dinghy ride and everybody got a chance to steer, even Rowan. Everyone was content to steer a straight course except Rowan, straight courses are so boring. He wanted to go from side to side and he was the one who found out how to speed up the motor. All of a sudden we were going very fast, Rowan was having fun. The marina here has a great layout for kids. 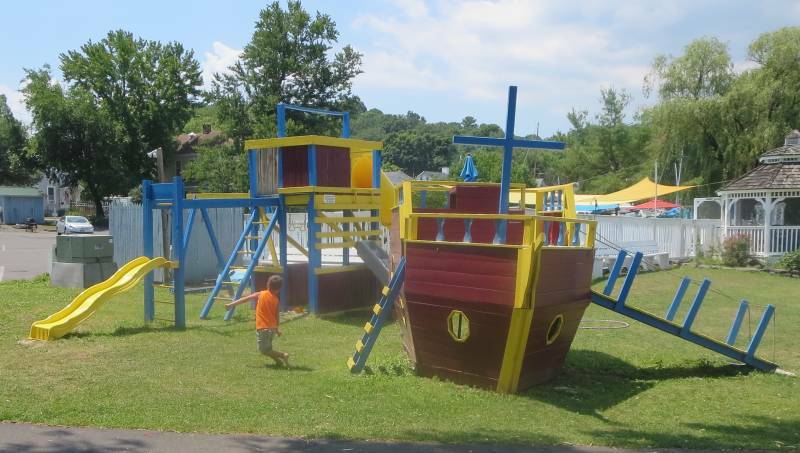 There's an outdoor ping pong table, a maypole, a volleyball net, a pirate ship and a climbing tower along with the major attraction of the swimming pool. It's only 3 ft deep at either end going to 5 ft in the middle. 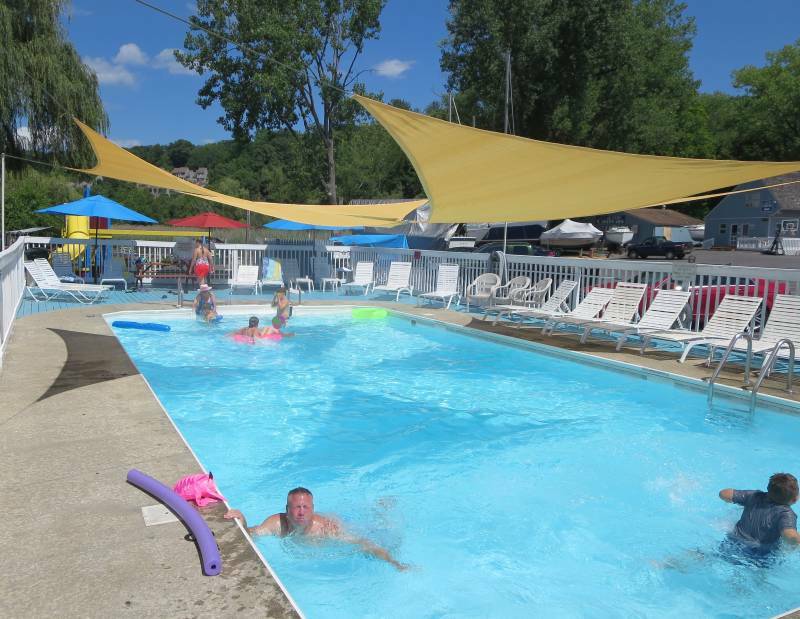 It even has shade, some awning over the pool in the middle. Here's Rowan swimming. And now it's Finn's turn. So both the kids and the grandparents got a good workout today, time to go home and rest! Sarah said we ought to do this for two weeks! I don't know about that but the time together was priceless. We're on our way home on Thursday to beat the afternoon thunderstorm predicted and then it's home for the night. So both the kids and the grandparents got a good workout today, time to go home and rest! Sarah said we ought to do this for two weeks! I don't know about that but the time together was priceless. We;re on our way home on Thursday to beat the afternoon thunderstorm predicted and then it's home for the night. Hello, it's me Natalie and I just got to say that Today was an awesome day! 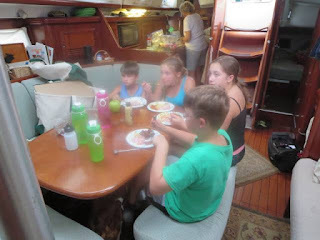 First we motored up to Eddyville and swam, played in the dink, and ate lunch. Then we backed tracked to Kingston and went into the pool and swam for a while. It was an exciting and exhausting day! I am so excited for tomorrow! Hello Sarah here and today was super fun, my cousins actually convinced me to swim off the back of the boat and I had a great time. After that we went to the place where we'd be docking and I caught the cleat once again. After that we went swimming again but in the marinas pool and we spent a good 2 hours there. Now we're tired out reading books and relaxing, well goodbye read ya later gator bye! Hello it's Finn again and it's Tuesday. So basically today we went to Connelly and today was great. We got to go in a pool, in the boat,etc... Motoring down the river was fun. The best part was playing the dink! Hello it's me again Rowan, I floated today and this my first time swimming in the water since I can't swim. I got to play in the dink and I got to float in the river and I almost sank because I was so heavy in my life jacket. Coming north from PYC every kid had their turn at the wheel. One thing you notice right off the bat is the tendency to treat staying on course via the Garmin as if it was a video game. 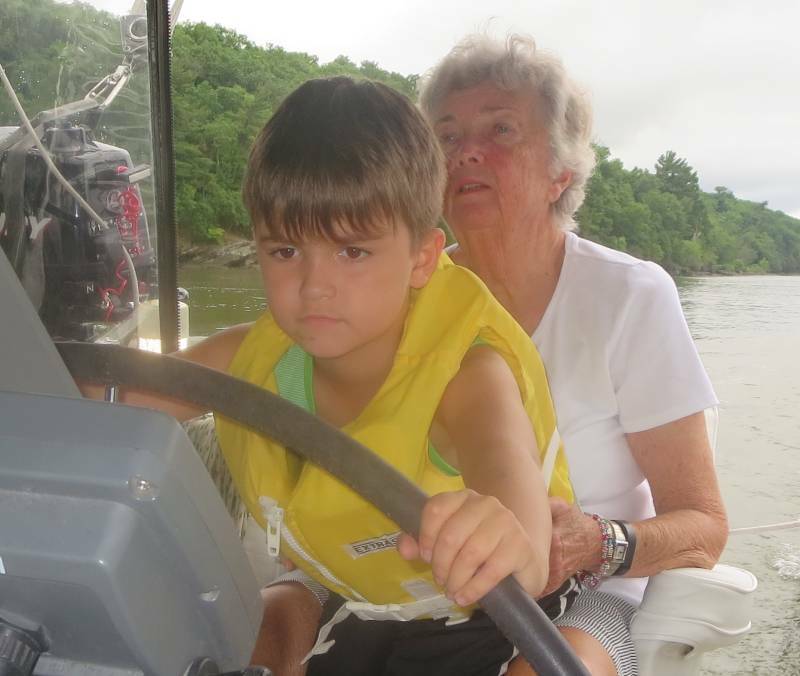 They stare intently at the Garmin and try to steer the boat along the course line instead of looking ahead for obstacles. 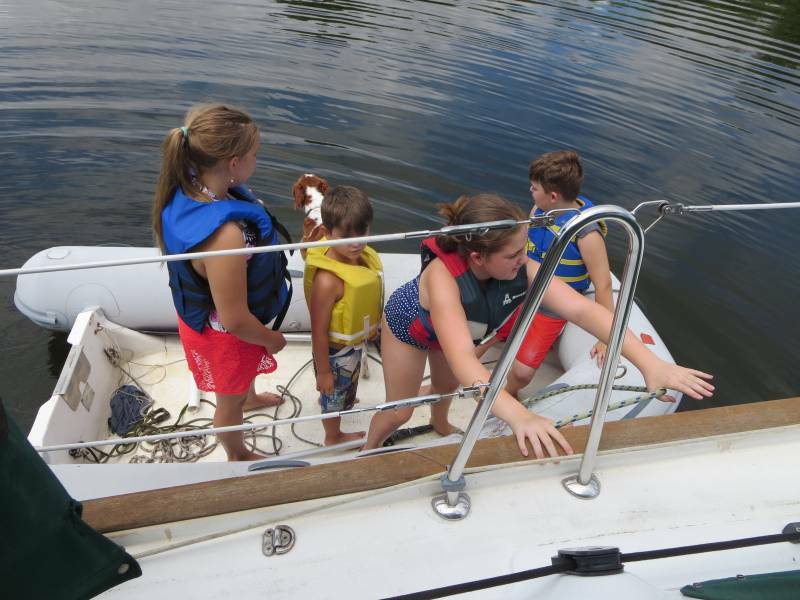 However, they are all learning and Sarah spent more of the time at the helm. Then it was time in the water, what grandkids don't like the water!? First it was in the creek at the anchorage and then in the pool by the mariina, lots and lots of time being wet. Meanwhile, I had a balky air conditioner to fix. With a high of 94 predicted for Wednesday, we did not want a non working A/C! Eventually I was able to get it running again by cleaning out the lines, debris had collected and the filter had split open, not too good on quality there. A pool with a sunshade! I think the kids had a good time and it's more pool time tomorrow and maybe a dinghy ride in the morning if the grandparents recover. 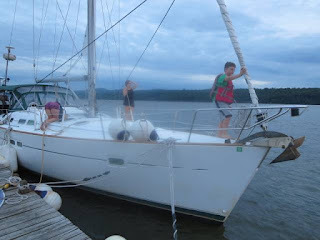 oday is our first day this summer on the Fleetwing and we have a real treat all four of us are going to write in the blog today. Hi my name is Finn, I am going first. Today I was starting to get used to the Fleetwing, but it rocks a back and forth a lot! But it does remind me of home, besides it's only four days on the boat. Plus I get to stay with my cousins! I mean seriously, they'll keep me occupied! Also, I get to sleep in the aft cabin which I never get to do when my parents are hear! : ) Hi I'm Natalie and I am very excited to go sailing tomorrow! I haven't done it in a long time and it gives you a break from life. You just feel the wind in your hair and relax! Then we are going swimming, with my cousins, too! Plus I might be able to drive the boat, which will be extremely fun if we do it!I am Rowan, I am going to have a Boston tea party, goodbye. Hello I'am sarah, today me and my family drove to my grandparents house to see my grandparents and spent a week with them and my cousins. Also our family got a new puppy a couple weeks ago and hoolie doesn't seem to have a problem with her. After we played a board game and ate lunch all of our parents went back home.Then we packed the van and headed to the boat. We all help prepping the boat for our stay. Now were just relaxing and hanging out. Well goodbye, you'll read us tomorrow bye. Our plan is to head north to Kingston for a dock at a marina that has a swimming pool, got to keep the kids happy. Hopefully we can do some sailing too. However, whenever a train comes by there's a stampede to the cockpit, the two boys like trains! I'm hard at work on updating the 2016 edition of the ICW Cruising Guide. There have been many changes to the hazards, the most important of all is the dredging of the Isle of Shoals just north of the Ben Sawyer Bridge. No longer do we all have to wait for high tide to transit the area! There are changes in store for the shallows south of Fernandina. The Coast Guard will be moving the buoys to direct boaters along a course few of us have taken but has 10 ft MLW. I verified the course on my way north this spring and it's very straight forwarded. It's another example of the charts being dead wrong. The 10 MLW route takes you over land according to the charts but we all know the charts are terribly wrong in that area. 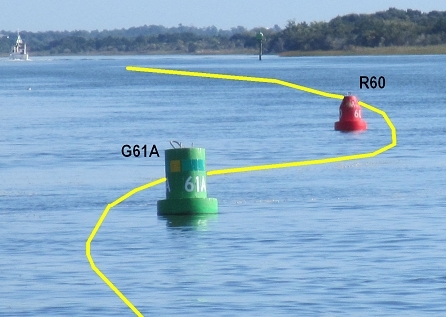 At any rate, we'll have buoys to direct us, hopefully in time for the fall migration. I have included waypoints for the new route in the guide. Some area remain problematic such as Hell Gate but I was able to find a 5.1 MLW route through the shoals which I will document with waypoints in the 2016 guide. Jekyll Island has always been a problem. It's not obvious where the channel is and the depiction of the channel is different on different chart suppliers. Garmin and NOAA ENC charts do not agree. In this case the NOAA ENC chart is correct (the NOAA raster chart is still wrong!) I plotted a course through this shallow area for 5.7 MLW after following two tugs with several hundred feet of dredge pipe at dead low tide! The waypoints will be in the new guide. With the addition of all the new waypoints it is becoming tedious to enter them manually not to mention the opportunities for errors. With that in mind, I will be posting a link to all the routes through the areas mentioned (and a few more) in GPX format. For those not familiar with the GPX file type, I've included a guide in how to load them into two popular iPad programs, the Navimatics Charts and Tides and the Garmin Mobile app. So as you approach one of the included hazard routes, you can switch over to Charts and Tides or the Garmin app and navigate your way through. As for the hazard maps, they are now labeled with the mile marker distance so they will be easier to find and a minimum depth reading included in the title header for easy reference. All markers now have oversized designations such as R10, G8 in large, block letters. Finally, for most of the hazards there will be a yellow line showing the deepest water I was able to find in the spring of 2016 through the hazard. I've included more marinas and anchorages we've found useful with a dog on board. The guide does not offer complete coverage of every marina and every anchorage, I focussed on the ones I use with a dog and spaced for an easy day's run on the way to Key West. As always, the information in the guide is all first hand. This fall will mark the seventh trip for Ann and myself down the ICW to Key West. However, I have included pertinent hydrographic charts of key shoaling areas from the Wilmington and Charleston ACOE surveys. 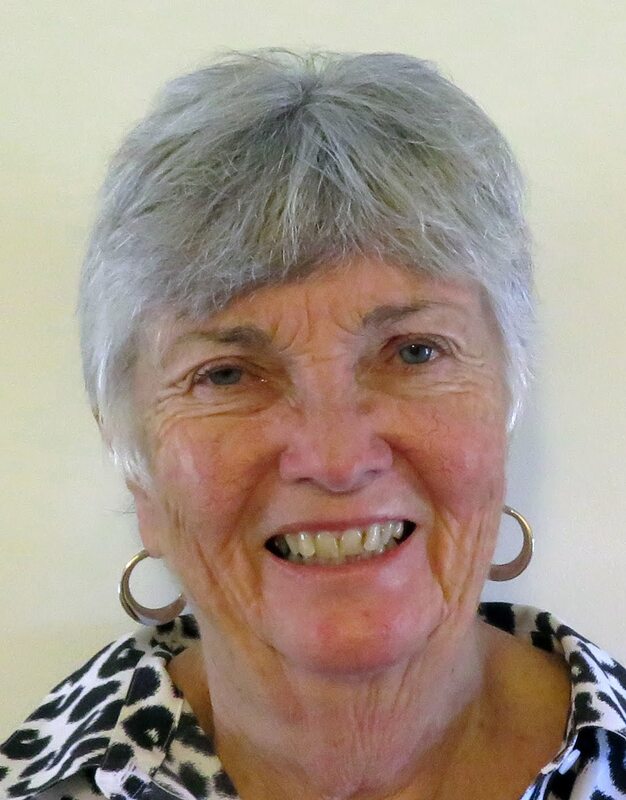 They offer additional insights on navigating difficult passages. When they have listed waypoints, I've included them in the guide and they will also be in the GPX list. The number of photos have been increased. Readers of my blog know that I'm fond of RE Mayo and Swan Point Marina although they are not prime marinas, they just happen to be spaced right for my travels. I included photos of them so cruisers won't be surprised by the "rustic" nature of the surroundings and can make their own choice before hand on whether it's for them. I am aiming for a publishing the 2106 version on Amazon.com by the end of July, hopefully before then but at least by July 31. Meanwhile I'll be posting selected pages on my blog for you to compare to previous versions and for comments. Stay tuned.